In London for a few days and I see they are having an elephant parade. This is the only one I have got close enough to photograph so far, and although bright enough in himself, he didn’t go far towards brightening the dingy turning off Oxford Street where he was located. One thing I love about this blog is that I feel obliged to do the research before I post anything, so I’ve just been to the London Elephant Parade website and downloaded the map of locations. It seems that the statue in my photo is Gajaraj, the artist is HH Maharaja Ranjitsinh Gaekwad of Baroda, and, if the document is up to date, he is up for adoption – the elephant, not His Highness, of course. 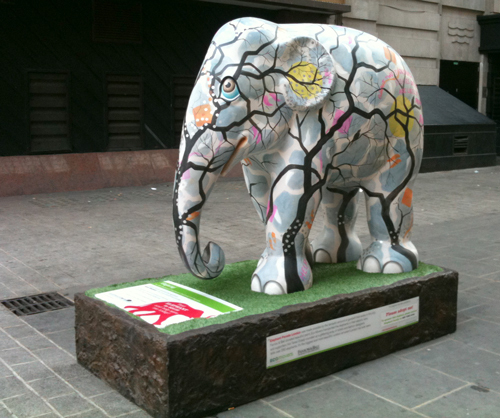 So, does anyone fancy sponsoring a work of art in aid of the conservation of the Asian elephant? Once the event ends, all the statues will be up for auction in July.